PingOne, a cloud-based single sign-on solution, allows you to sign into all apps with one username and password. Set up is easy and offers a variety of benefits including security, personalization, and much more. 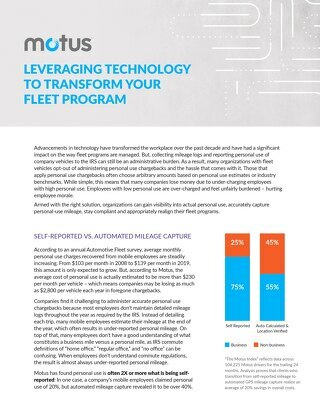 Learn more about this SSO opportunity in our one pager. 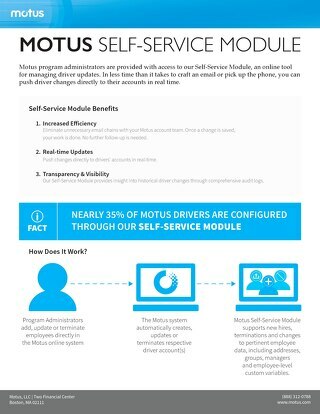 A one pager outlining the general overview of the Motus self-service option. 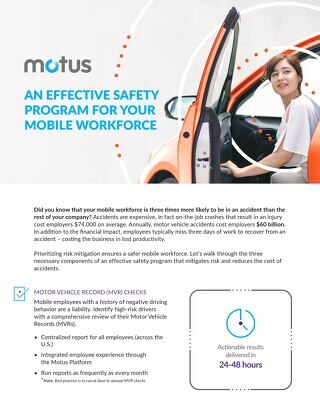 Safety should be a top concern for all companies, especially when it comes to their mobile workers. These training's improve mobile workforce safety, and just in time for the Holiday Season. 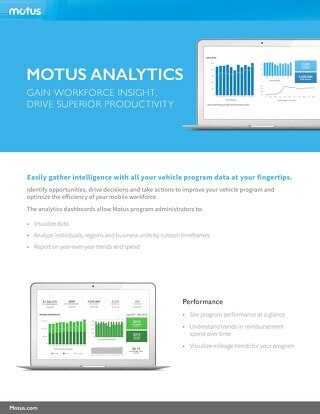 A one pager outlining Motus Analytics dashboards for program administrators with screenshots. An article that shares the necessary components of an effective safety program: MVR checks, Insurance Verification, and Safety Training. 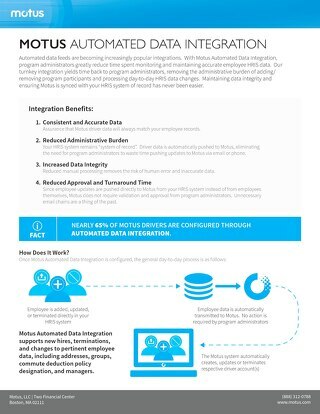 An article summarizing the benefits of integrating Motus with Concur and an overview of how it works. 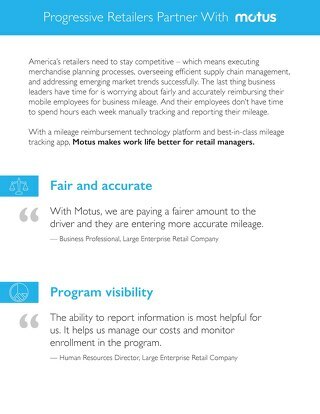 This retail-focused one-pager explains the benefits of FAVR, specifically with overcoming implementing a new policy. A one-pager sharing quotes from clients. 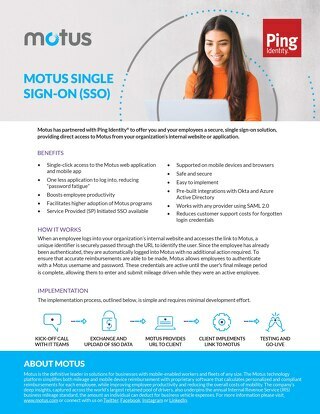 A one-pager outlining how Single Sign-On (SSO) works and its benefits. 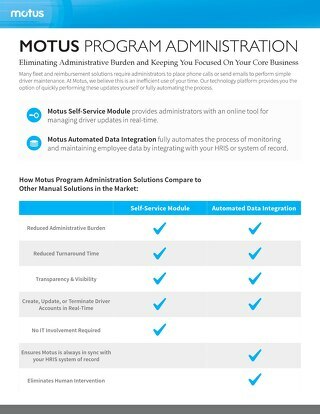 A one-pager overviewing Motus program administration options, includes one-pagers for Self-Service and Data Feed. 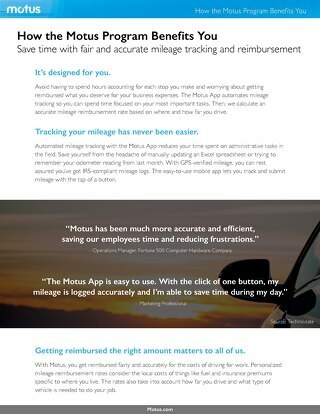 A one pager about what Motus does, and how Motus Mileage Capture Technologies work with Salesforce. 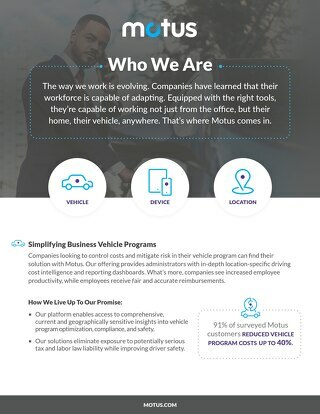 A one pager covering Motus benefits, Concur integration, and Motus Mileage Capture technologies. 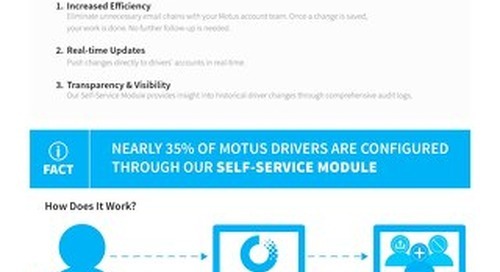 A one page general overview of the fleet product with Motus. 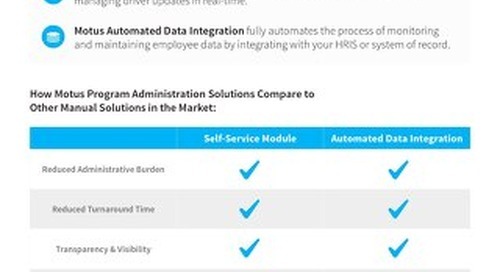 A one page general overview of data feeds. 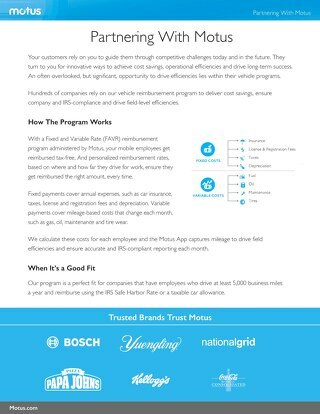 A one pager highlighting the benefit of the FAVR program as compared to fleet/flat rate, how the fixed and variable is calculated. 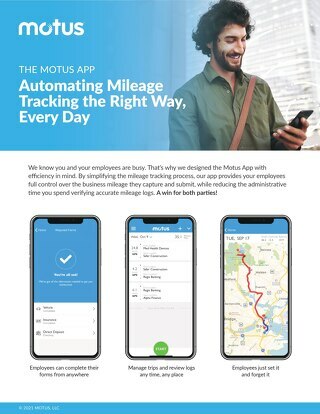 A one pager outlining commute deduction guidelines per the IRS Definition of a "Business Mile."